"She seemed to be having a hard time with the bigger pieces," he explains. Unfortunately, the kibble didn’t stay down, leaving Kantor with a most unwanted "gift" to clean up. He surmises, "I guess she wasn’t able to chew the large chunks quickly enough." 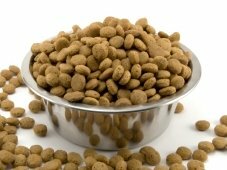 Kibble size isn’t the only reason to feed your best friend food specific to breed size. Appropriate nutrient levels also vary based on whether your dog is small, medium, large or giant. 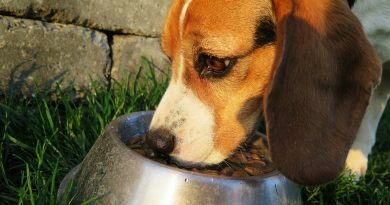 Below, veterinarian Trisha Joyce, DVM, of New York City Veterinary Specialists, weighs in on the importance of size-specific feeding. Your dog’s weight at maturity determines its breed size, whether your pet is a big purebred or a tiny mixed breed. A giant-breed dog may reach 90 pounds or more at maturity, while a large breed will grow anywhere from 51 to 90 pounds. A small/toy dog will weigh up to 20 pounds as an adult. Any furry friend in between – 21 to 50 pounds – is a medium-size dog. While breed size is an important food factor at every stage of life, it may be the most important during puppyhood, when proper nutrition sets the course for future health. "All puppy diets support growth, but breed size matters a lot," explains Dr. Joyce. "Small- and medium-breed dogs can safely grow very quickly, while the same is not true for large- and giant-breed dogs." She adds, "To prevent orthopedic issues – such as disorders of the skeletal system and associated muscles, joints and ligaments – we try to slow down their growth." To feed small- or medium-breed food to a large-breed puppy could put the puppy at risk for malformations, such as hip dysplasia, a gradual loosening of the hip joint that can ultimately be crippling. Large-breed puppy formulas are a bit lower in calories and calcium, helping to prevent unhealthy growth spurts. Post-growth, different breeds still have different needs. "Caloric needs vary based on breed size," says Dr. Joyce. Small and toy breeds have higher metabolic rates – more than twice those of large breeds – as well as smaller stomachs. They therefore function best on energy-dense diets, and small meals. Small-breed formulas have more calories per cup than medium- and large-breed foods, making an energy-packed diet most appropriate for them. Large and jumbo dogs have their own special nutritional considerations, mostly related to joint health issues. "In adulthood, larger dogs are prone to orthopedic problems and arthritis, so you may want to select foods that have protective substances for their joints, like glucosamine," says Dr. Joyce. Supplements such as glucosamine and chondroitin, which are sometimes included in commercial dog chows, are thought to maintain your oversized pet’s cartilage. "The rate at which a dog ages depends on the breed," explains Dr. Joyce. The larger and heavier the dog, the earlier the aging process begins. A large or jumbo dog should then begin eating a "maturity" diet earlier than a small or toy dog. Larger breeds tend to have shorter life spans, so they might be considered seniors as early as six-years-old, while smaller dogs don’t generally reach senior status until 10 years. Check with your veterinarian if you’re not certain when a maturity diet should be started. The nutritional makeup of all senior diets should include immune-system supporting antioxidants, like vitamin E and beta-carotene. But such diets also vary by breed size. Large and jumbo dogs are still in need of nutritional support for their sensitive joints, so glucosamine should be on the ingredient list in your large or jumbo pet’s formula. 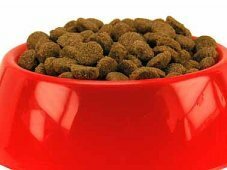 Similarly, small dogs continue to need food that is energy-dense, and the calories per cup should be higher than for medium and large breeds. As for Kantor and his pug Sadie, they had to make do over Christmas. "I cut the kibble pieces in half before I fed her Christmas day!" he recalls laughing. "The next morning, the stores were open super early, and we were back to her small-breed kibble by breakfast."